The 2017 IBC Show is in full swing in Amsterdam, and the SVG Europe and SVG Americas editorial teams are out in full force, covering all the latest news from the show floor. 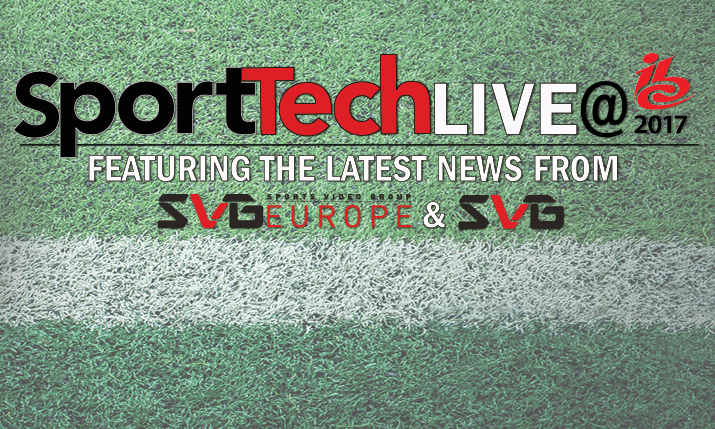 In an effort to make the tidal wave of news and announcements more digestible to our readers, SVG is providing a daily “SportTechBuzz at IBC 2017” roundup. This daily rundown provides snippets of big announcements and what is on display at hundreds of stands at the RAI this year. Here is the Day 1 (Friday Sept. 15) SportTechBuzz roundup, featuring news from Canon, Fujifilm, Multidyne, Vizrt, Evertz, Grass Valley, Harmonic, and Ross Video. With everyone looking at next-generation services like UHD and HDR, it’s time to also look at next-generation lens technology. That’s why Fujifilm’s stand (12.B20) is worth visiting to check out the UA24x7.8 lens, which the company says is the smallest and lightest 4K- and HDR-compatible lens. Tom Fletcher, director of sales, Fujifilm Optical Devices Division, says it is a great fit for 4K camcorders and other compact cameras that, increasingly, are part of the 4K-production landscape. Fibre transport is increasingly part of every sports production, and that is one of the reasons Multidyne Fiber Optic Solutions (Stand 11.D40) has rolled out the VF-9000, a 1RU device that can support up to 36 video-signal conversions across HD, 3G, and 12G from one unit. Users can mix any combination of optical and copper connections to achieve the desired balance of inputs and outputs. It also has two hot-swappable AC power supplies for redundancy, critical for fast-paced live sports productions. The Viz Eclipse system that allows broadcasters to virtually replace field-side advertising boards will be on display at the Vizrt stand (7.A20) fresh off news that it is being used by Infront for the 2017-18 football season. It was tested earlier this year, and Stephan Würmlin Stadler, chief product officer, Vizrt, says the positive feedback led to the first installation at VfL Wolfsburg in the Bundesliga. The current version allows region-specific ads in TV feeds, generating new revenue streams for rightsholders looking for targeted marketing. Evertz (Stand 1.D31) is creating a lower entry point for its DreamCatcher replay- and live-production platform with the launch of DC-ONE. Targeted at smaller live productions, such as college and high school sports, DC-ONE is built on the same hardware as the existing high-end DreamCatcher system. Although it does not have the full DreamCatcher feature set, it incorporates the primary DreamCatcher tools, including zooming and frame-accurate split-screen views, as well as support for ganged inputs and playlist flattening. DC-ONE is also upgradable to the full DreamCatcher feature set, should the customer wish to migrate to higher-end productions. IBC also marks the European debut of two DreamCatcher tools introduced at NAB 2017: DC-LIVE-EDIT (an NLE tool integrated into the DreamCatcher interface) and DC-MG (a media gateway and content-management system running on the DreamCatcher Network). In addition to DreamCatcher, Evertz is highlighting its SDVN IP-based tools, 25GbE solutions (including the new EXE-VSR16 Video Service Routing platform), inSITE big-data analytics engine, Cloud Native Virtualized solutions (including Mediator-X, OvertureRT LIVE, and RenderX), UHD and HDR solutions (including 7814UDX SDR-to-HDR and EQX-IPG and EQS-4GB modules EQX routers to enable IP and 12G-SDI interoperability), Video Delivery Infrastructure solutions (including the 570ITXE on-ramp IP gateway), RF solutions (new DVB-S2x satellite receivers, IRDs, and demodulators), transport and remote production (the new 3606FRS media gateway for IP transport and evRemote @home production). With an eye on expanding its 4K and HDR toolset, Grass Valley (Stand 13.A05) is adding three models to its LDX C86N Series of compact cameras and has upgraded its K2 Dyno replay system to feature what the company is calling “the smallest footprint per channel of any 4K-replay solution.” The three new ⅔-in.-imager camera models (joining the LDX C86N WorldCam and LDX C86N 4K) are the LDX C86N HiSpeed, which offers all the WorldCam (HD) formats as well as the 3X 1080i/720p functionality; LDX C86N XtremeSpeed, offering 3X 1080i/720p/1080p and 6X 1080i/720p functionality; and the LDX C86N Universe, which combines all the HiSpeed and XtremeSpeed formats plus native 4K UHD. In addition, Grass Valley is teasing the latest generation of its K-Frame switcher frame: K Frame X. Being demonstrated at Grass Valley’s stand, the K-Frame X video-processing engine will feature all–IP-enabled I/Os and the capability for the switcher’s full 192×96 configuration to be used for native 4K production (rather than the reduced K-Frame I/O count currently available for 4K). The K-Frame X, which will be compatible with any Grass Valley panel, is slated to launch in February with additional 4K-I/O support coming in January 2019 via a software upgrade. Grass Valley continues to focus on its “Glass to Glass IP” strategy and is showcasing its range of cost-effective live-production tools. Other Grass Valley announcements at IBC include the European debut of the K-Frame V-series switchers with a brand-new GV Korona 3M/E panel, the latest versions of its newsroom platforms (Ignite v10 automated production, GV STRATUS 6.0 content management, and EDIUS 9 NLE), the latest version (2.12) of its iTX playout solution, and new/upgraded monitoring and conversion products (including the Densité UHD-3901-UC SDR-to-HDR mapping card, Kaleido-IP multiviewer, and Densité HCO-3901-4K quad-link). Harmonic (Stand 1.B20) has expanded the media-processing– and -delivery–workflow capabilities for its VOS media-processing software and VOS 360 managed services to simplify OTT delivery. New workflow orchestration and delivery functionalities include streamlined content capture, UHD support, personalized ad insertion, and multi-cloud support for operators to deliver OTT services from multiple public-cloud platforms — such as AWS, Google Cloud, and Microsoft Azure — simultaneously. In addition to continuing to promote its “Smart Production” message, CEO David Ross announced that Ross Video’s (Stand 11.C10) EMEA headquarters will be moving to a new Reading facility that is twice the size of its current London location. Ross Video’s big sports-tech news at IBC 2017 revolves around its Frontier virtual-studio-graphics-rendering solution, Xpression Tessera real-time graphics platform, and Ross Abekas Mira Express replay system. Frontier uses the power of the Unreal 4 game engine to render hyper-realistic scenes, textures, and dynamic effects. The system was recently used by Turner Sports to create virtual Street Fighter characters for its live ELEAGUE production at its Atlanta studio.